Well DigiKey's website is how websites would be if robots took over the earth. If you can navigate that horrible site then you deserve the better price lol. Digi-Key's website is made for people who know exactly what they want. Their parametric search is the best one around. When I go to DigiKey or Mouser, I usually don't even know what I want so the lack of any understandable description is absolutely infuriating. I have never bought from them, probably never will in the next 5 years. Half the stuff on there I have no freakin' idea what does. Still no info on the price. I keep looking for some sort of "pack of 4 or 5" in the description. I can buy a four-pack of these from Radio Shack for 99 cents. If you want to deal with Digi-Key you deserve the lower price, but being more expensive than RadioShack is just ridiculous. I understand SFE needs to make a buck, and I have no problem supporting you guys cause you're awesome. However, your price on this is insane. 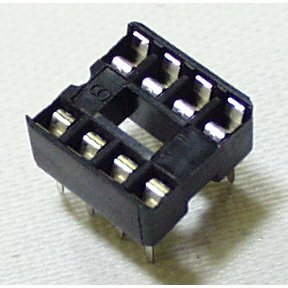 3M has a line of IC sockets that you can get off digikey that are over a buck cheaper than this. Have you ever had a bunch of ATTiny85's where you need to be able to change them out for programming or do different functionality on the same pins? Well, this product is for you. Solder this onto a small protoboard with all the resistors and buttons you need for programming an ATTiny85 with the AVR Programmer, and you're set! The ATTiny85 fits well into this, and the connectors are pretty strong to keep the chip in (especially if you throw it against the floor out of frustration). That's all it needs to do.